Today proved to be a very sad day in the history of Chelsham Garage. It was the last day of operation of local Bus services, the day started in the usual way, the canteen opened for business as usual but for the last time, buses were prepared for duty on Routes 127, 289, 403, 594 and 595 and the vehicles and crews went out on the road in search of business. During the day AN's 346 and 356 were sent away to Guildford Garage (GF) and LN 77 newly repainted in London & Country livery went off to Leatherhead Garage (LH). Seven SNB's (99, 147, 189, 328, 352, 366 and 510) and the six relatively new Volvo Citybus double deckers (625, 633, 634, 635, 636, 638 and 643) were all sent to Godstone Garage that night after doing their days work from Chelsham. AN 299 had come back from being on loan to Reigate Garage (RG) and was lined up along with Chelsham's own AN's (295. 296, 297, 298, 300, 303, 304 and 305) Four other withdrawn AN's (335, 361, 365 and 380) made the total up to 13, truly an unlucky number for Chelsham Garage! Seven AN's (124, 184, 188, 191, 197 and 229) arrived from Godstone Garage to join Chelsham's own AN's (196, 223, 226, 267 and 268) ready for working Route 196 Norwood Junction to Brixton which started running from Chelsham Garage the next day. Later that evening the last local bus journey to be operated from Chelsham Garage, Route 403, the 22.11 Chelsham Garage to Cheam Village and the 23.11 Cheam Village to Chelsham Garage was worked by Chelsham's own AN 302 duplicated with privately preserved RT 604 and RMC 1487. London Buses, South London Transport ran the evening timetabled service using L Class Leyland Olympian double deckers from South Croydon Garage ( TC ), which took over Route 403 completely from the following day. 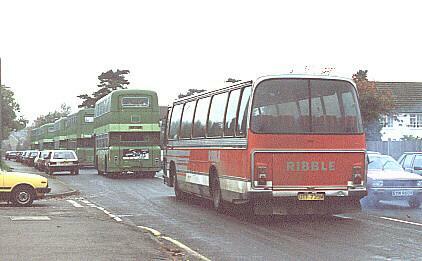 The buses made redundant were prepared ready for their journeys to the North West of England. The Bee Line Buzz Company drove south in Ribble Leyland Leopard Coach 1059 Registration number UTF739M arriving at Chelsham Garage during the morning of Saturday 28th October. The 13 AN's were driven north via Whyteleafe, The A22 and the M25. 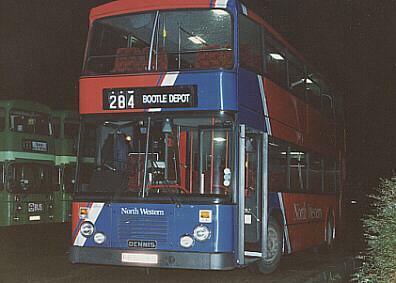 It was after dark that evening before The North Western Road Car Company arrived from Bootle Depot with their Dennis Dominator Double Decker registration number F632BKD to collect the 3 SNB's and 1 AN double decker. Nine of the AN's line up at Chelsham Garage awaiting the Bee Line Buzz Co. to come and collect them before the rain set in. Six of the AN's departing from Chelsham en route to Bee Line Buzz Co. with Ribble Leyland Leopard 1059 following close behind. SNB's 219, 332, 335 and AN 355 wait patiently for The North Western Road Car Co to come and collect them later that evening. North Western Dennis Dominator has just brought the crews to drive the 3 SNB's and the AN from Chelsham to The North West. The night before, Friday 27th April saw the very last day of passenger bus operation at Chelsham Garage, AN197 had arrived back from the last journey on Route 196 then the following morning, Saturday 28th April the engineering staff prepared the redundant buses for their exit from Chelsham Garage. The buses were driven away to their new homes during the morning. Five vehicles remained at Chelsham Garage as engineering spares. 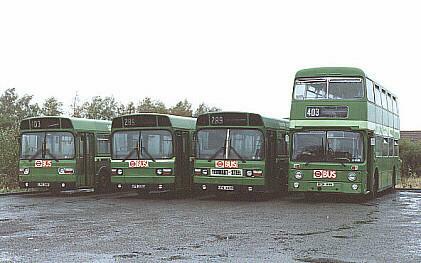 From Saturday 28th April 1990 until Friday 29th June 1990, Chelsham Garage was used for engineering purposes and many buses were sent from their home garages for attention. By the final day the five engineering spare AN's had dwindled down to three. 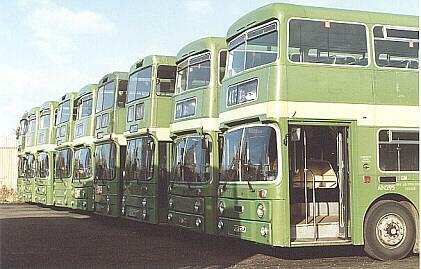 The large blue doors were finally closed at Chelsham Garage, after sixty five and a half years, and the fate of the three remaining buses is shown below.